Our PTA Annual General Meeting is on Monday 17th October at 7.30pm. All parents and staff are welcome to attend. 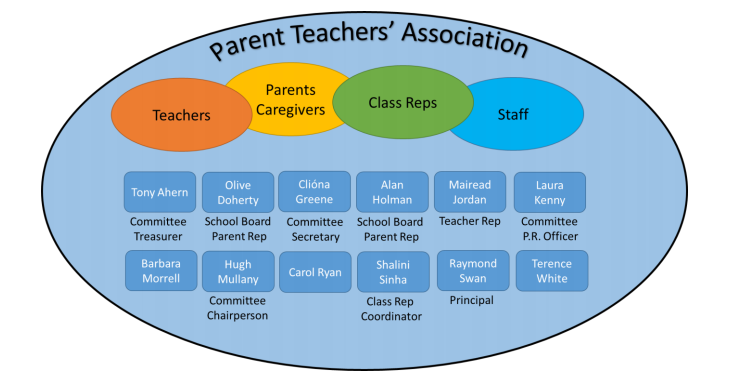 All parents, caregivers, staff, teachers and special needs assistants are part of the Parent Teachers’ Association (PTA). The PTA Committee, along with Class Representatives, helps organise events that support the school community, fundraise and welcome and listen to parents’ ideas. You can get in touch through our Facebook page, the mobile number above, or contacting one of the PTA Committee members. The schedule of events and after-school classes and activities is always evolving. Watch for the school newsletters or the PTA Facebook page for updates. We always want to hear from those who want to help, have ideas or have some time or skills to offer.